We are a diverse community of God's love where each person is valued. We worship, serve, and celebrate. We seek to become a church empowered by the Holy Spirit so we may love one another as Christ loves us and create a world of peace and justice. 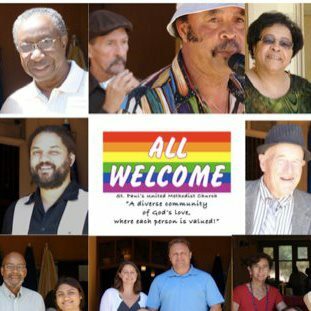 We are a reconciling congregation, intentionally welcoming all persons regardless of age, race, gender, sexual orientation, cultural background, physical or mental health or ability, family status, or financial circumstances. We welcome all who wish to worship. ... and now for the unofficial version. 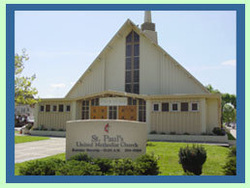 St. Paul's is the kind of community where you can really be yourself. You will meet people who are different from you and you will be encouraged to love and accept them- even as you are loved and accepted. We talk about God and God's love, but even more we try to live it out. You'll find St. Paul's people doing acts of justice and kindness all week long. We are a people filled with strong opinions. And we want to hear your opinion, too. We have optimists and pessimists among us, as well as introverts and extroverts. Some of those who have recently joined the congregation have called us their "family" as they are separated by continents from their families of origin. Recently, a 4 year old guest exclaimed, "I like this Church, mommy!" When we gather together we are usually smiling, but we come alongside each other during the hard times, too. We are letting the light of Christ shine- all over St. Paul's, all over San Jose, we're going to let it shine!